The 2019 National Championship Game kicks off on Monday the 7th of January. The Alabama Crimson Tide will take on the Clemson Tigers at Levi’s Stadium for the national title. Monday’s 2019 National Championship Game will be the third time in four years that Alabama and Clemson have met for the national title. Both universities are in the midst of dynasties. Only one team will take the national championship, however. 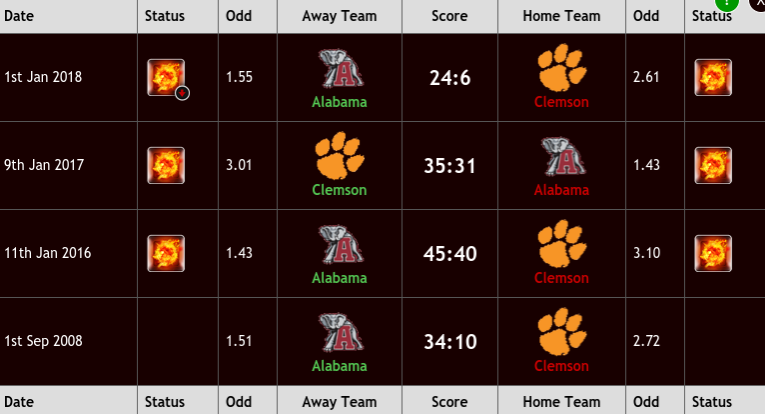 No matter how you slice it, the Clemson Tigers go into the National Championship Game as the underdog, according to leading sportsbooks. The Tigers may have finished the season at No. 2 in the nation with a 14-0 record and an ACC Championship, but sportsbooks know just how strong Alabama is. Clemson defeated Alabama in the 2016 National Championship Game having lost the previous year’s title decider. Last year, the two universities met in the semifinals with the Crimson Tide coming out on top. The 2019 Championship Game will mark the fourth straight season the two schools have met in the postseason. Clemson could be without cornerback Mark Fields. He missed the team’s Cotton Bowl win over Notre Dame. Fields’ loss could open up the passing game for Alabama. The Crimson Tide has the No. 6 passing offense in the country, which also ranks No. 1 in passing efficiency. Like Clemson, Alabama is ‘burning hot’ going into the national title game and Nick Saban’s team will appear in its fourth National Championship Game. Alabama’s only season to miss the title game was in its first year when Ohio State and Oregon played in it. Alabama is also 14-0 and goes into the game as the No. 1 ranked team in the nation. The Tide defeated Georgia in the SEC Championship Game before beating Oklahoma in the Orange Bowl. Ten times this year, Alabama has scored 40 or more points against opponents. Twice the team’s defense held teams to shutouts. Both LSU and Mississippi State failed to score against Alabama. It is that stout defense that Clemson must get through on Monday night. Saban may have to do without linebacker Christian Miller against Clemson. He is practicing, but his hamstring injury — suffered in the Orange Bowl — could keep him on the sidelines for the 2019 National Championship Game. 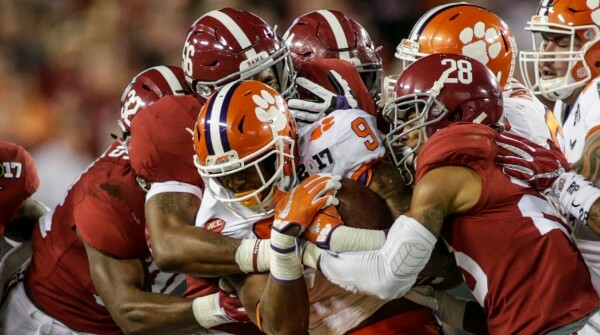 Alabama Crimson Tide vs. Clemson Tigers – Who will win? Since 2008, Alabama and Clemson have met four times. The Crimson Tide has come out on top in three of those games. Alabama was able to score 24 or more points in each game with only the two National Championship Games being close. 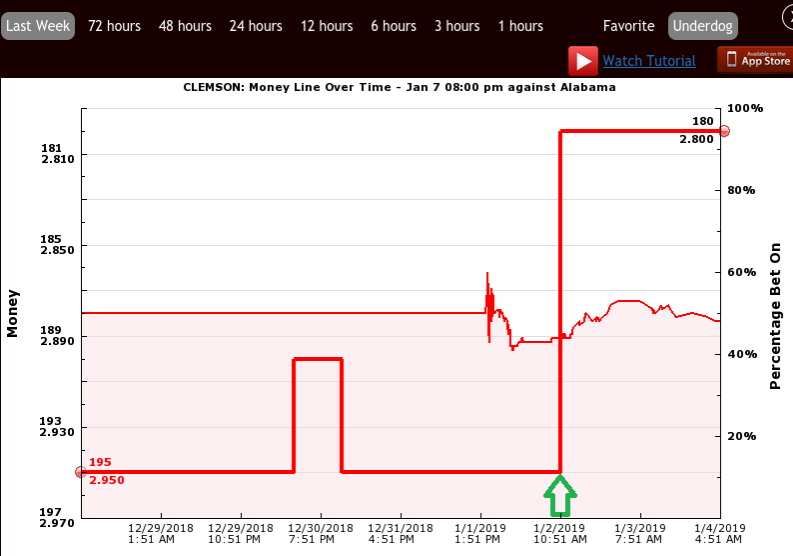 In recent days, there has been a money line shift with Clemson getting a lot of love from bettors. Alabama has the historical record over Clemson along with being an incredibly strong football team. Clemson is fun to watch and it has carried its underdog status well over the last few years. Clemson may have better depth on the offensive line, but Alabama is phenomenal through the air. If the Tigers are without their starting cornerback (Mark Fields), it will take away a player who can break up pass plays. Alabama is on a different level in college football. The Tide is nearly unstoppable and Clemson won’t prevent it from winning another national title.